The work of a CPPR initiative proceeds in three broad stages. 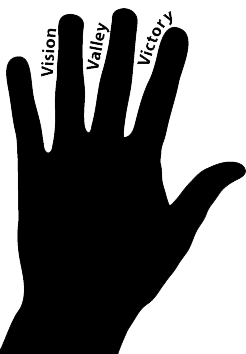 We use the symbol of three Vs to represent the stages—the three Vs that can be visualized if you hold up your open hand and look at the spaces between your fingers. The “three Vs” are Vision, Valley, and Victory. Vision. Vision is a shared view of a project’s goals and strategy. Developing a truly shared perspective may take longer than one anticipates, and is its own distinct piece of work. Members may have very different views of issues, timing, strategy, participants, and desired outcomes. A clear and mutual understanding of the vision is vital to every stage of the project. Valley. The valley is doing the project tasks to realize the vision. The word “valley” emphasizes that a lot of hard work is required to “climb the hill” to success, and knowing that it will be hard work can help to avoid discouragement along the way. The challenges of this stage range from developing the partnerships needed for the task, developing strategies to address the issue, obtaining broader community feedback, piloting and evaluating new strategies, and proceeding to a main implementation phase. Accomplishing work of this scope usually requires breaking the project into manageable tasks, organizing working groups to accomplish the tasks, developing an action plan for each task, and evaluating the success of the work. Victory. Victory is acknowledging and celebrating your success, developing and disseminating products, sharing the story with others, and ensuring sustainability and related policy changes. Every successful meeting, every mutually agreed-on compromise, every completed action plan is one of a series of victories. The Victory stage refers however to a phase of work that completes the project while building capacity for the next partnered activity. Within each stage – Vision, Valley, and Victory – community and academic members work together to develop and complete action plans. The stage is planned and conducted, and joint evaluation of the outcome of the work at that stage informs the planning of the next. Vision, Valley, and Victory are separate stages, but the work often overlaps, they may be going on all at once in complex projects with multiple action plans being pursued by different working groups and subcommittees.